Moles are dark little lumps found on the surface of the skin. Most moles are harmless, but in a few rare cases, they can develop into an aggressive form of skin cancer called malignant melanoma. They are formed due to collections of cells known as 'Melanocytes.' Sometimes moles are present at birth, however, most moles occur during the first 30 years of life. Conventional treatments for moles can be invasive and can often include surgery under local anaesthetic. To avoid this, there are a number of natural treatments that are both painless and leave no scar. How can ACV help with Mole Removal? 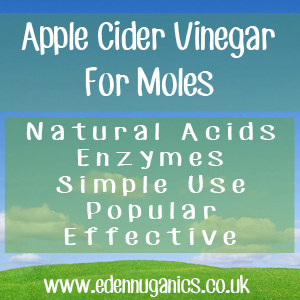 Apple cider vinegar is a natural tonic packed with enzymes and able to remove your mole completely with little or no pain at all. It contains Malic and acetic acid. These two powerful, naturally occurring acids are great at dealing with skin issues including moles, warts and skin tags. The natural acids don't just remove the surface of the mole, but instead work their way right to the root helping the whole blemish to fall off in one piece. First, clean around your blemish with lukewarm water and mild soap. The next step is to dry the skin thoroughly. Scratch the mole gently with a toothpick, be sure not to let it not bleed. Soak a small piece of cotton ball in raw apple cider vinegar and squeeze out the excess vinegar. Place the soaked cotton wool over the mole and hold it with a bandage. Leave the ACV to work its magic overnight. Remove the bandage and cotton wool the next morning and rinse thoroughly with water. Repeat it for 3-4 days, until the mole hardens, dries and falls off. Apple cider vinegar can be used in combination with petroleum jelly to reduce acid damage to the healthy surrounding skin. The method can be especially useful for children whose skin can be easily damaged. Apply Vaseline to the skin around your mole so it's fully covered. This actually prevents the acid in the vinegar from eating away at the skin you want to keep. Take your cotton ball and apply some apple cider vinegar. Place the vinegar soaked side on your mole and place a bandage over it so it stays in place. If you do this three times per day you should see results within a couple of weeks. After a week most people notice that the mole starts to flake and dry up. This is normal, so don't be alarmed. Let the mole fall off naturally. Try not to rub or scratch it. After the removal is done, there should be no scar or sign that the mole was there in the first place. Iodine - Iodine is another effective natural remedy for the removal of warts. Working in much the same way as apple cider vinegar, iodine should be applied to a cotton pad and held over the mole for a number of days until it comes away of its own accord. Garlic - Rubbing garlic over your mole daily is an age old remedy in the treatment of these skin conditions. Be warned, however, garlic has a strong odour so this can be far from ideal in an office environment. Baking Soda and Castor Oil - These two ingredients can be mixed together to form a powerful mole removing formula. Make into a paste and apply to the mole 4 times a day for around a week.